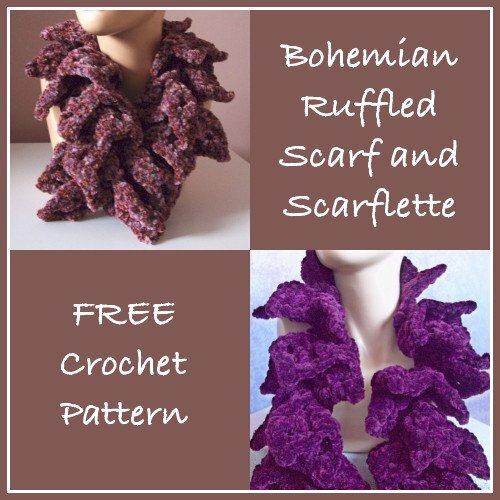 Here is the crochet pattern for my bohemian ruffled scarf and scarflette. It is now available for free and you can sell the finished item if you like. The yarn that I used was Patons Bohemian, but any chunky yarn should work to make these scarves. Material: Patons Bohemian, 4 80g. balls for scarf & 3 80g. balls for scarflette. Finished lengths: Scarf measures 54″, Scarflette measures 27″. Picot: Ch 2, sl st in second ch from hook. Ch 78, continue with rows 1-5. Ch 39, continue with rows 1-5. Row 1: Sc in second ch from hook, *ch 2, sc in next ch. Repeat from * to end. Turn. Row 2: Sl st into lp, ch 1, (sc, ch 3, sc) in same lp, *ch 1, (sc, ch 3, sc) in next lp. Repeat from * to end. Turn. Row 3: Sl st into lp, ch 1, 5 sc in same lp, *sc in ch-1 sp, 5 sc in next lp. Repeat from * to end. Turn. Row 4: Ch 1, sc in first st, *ch 2, sk next st, (dc, ch 1, dc) in next st, ch 2, sk next st,** sc in next 3 sts. Repeat from * to last st ending at **, sc in last st. Turn. Row 5: Sl st into lp, ch 1, 2 sc in same lp, *(2 sc, picot, 2 sc) in next lp, 2 sc in next lp,** sk next st, sc in next st, sk next st, 2 sc in next lp. Repeat from * to end, ending at **, sl st into last sc. Fasten off. Button for scarflette, (optional): Ch 2, 12 sc in first ch, join with sl st. Fasten off and attach to scarflette about 2-3″ from end. Use any hole on corresponding side as buttonhole.